Following a tease by the company&apos;s president back in August, Chinese manufacturer Xiaomi has now officially announced its next all-screen monster handset, the Mi Mix 3. Boasting a FHD+ AMOLED display with a stunning 93% screen-to-body ratio, the Mi Mix 3 also packs a powerful 2.8GHz Snapdragon 845 processor into its unique frame, along with the option of 6GB, 8GB or a whopping 10GB of RAM. Those after the 10GB model will have to track down the &apos;Forbidden City&apos; limited edition, which sports traditional Chinese styling, a 10W wireless Qi charger and a collectible statue. Just as we&apos;d predicted, the Xiaomi Mi Mix 3&apos;s slidable display can be flicked down to reveal dual front-facing cameras (24MP primary and 2MP depth sensing) – a design choice that appears much more practical than the Oppo Find X&apos;s motorised pop-up camera, which seems destined to break down after repeated use. On its rear, the Mi Mix 3 will also carry a 12MP + 12MP dual camera arrangement. "Mi MIX 3’s patented slider incorporates neodymium magnets that have been carefully calibrated," stated Xiaomi in its announcement. "Once the screen is pushed down, the magnetic mechanism immediately kicks in and finishes the opening in a snap with just the right amount of force." According to Xiaomi, the company "has dedicated substantial resources to the production process to ensure the slider has a life expectancy of 300,000 cycles in lab tests." The 6GB variant offers 128GB of storage for around $475 / £370 / AU$671, while the 8GB (roughly $575 / £448 / AU$812) and 10GB (about $720 / £561 / AU$1,017) models provide 256GB of storage. 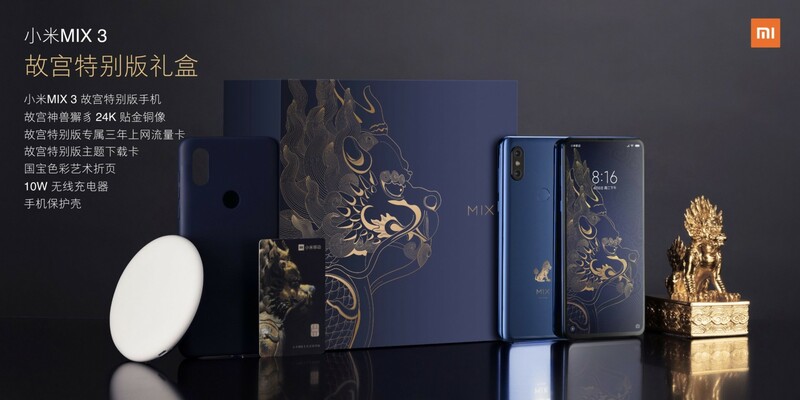 Along with the decal-sporting Forbidden City edition (also referred to as the Palace Museum edition), the Mi Mix 3 will also be available in Onyx Black, Jade Green and Sapphire Blue color options. The Xiaomi Mi Mix 3 has a Chinese release date of November 1, 2018. At present, there&apos;s no word on when it will be released in other markets, though Xiaomi has said that a 5G version will arrive at a later date.